Wherein your humble scribe presents a Five Room Dungeon for use with Mini Six, with some creation help from the random tables in D6 Fantasy Locations. This is, of course, largely compatible with D6 Fantasy as well. The grim, human-hating Fire Giant Matulek has a new plan. With the help of a powerful kobold shaman he has summoned the demon Kuula Gaahal and bound it into the forge that stands within the walls of his castle. There, on the Island of Fire within the caldera of the volcano men call Mount Kurash, Matulek is producing demonic steel for the dark dwarves of Doborgajn to turn into weapons that will lay waste to mankind once and for all. King Borvalf of Tolvir has called upon the mightiest warriors of the land to storm the giant’s castle and destroy the forge lest Matulek’s evil plan come to fruition and darkness once again claim the lands of the north. A single stone-and-mithril bridge spans the lava moat the surrounds the Island of Fire. Its gatehouse is guarded by two dim-witted hill giants, Mrog and Urr’m, and a lone, lazy Hell Hound who answers to the name of Vorom. The guards have been ordered to kill any humans who approach, as well as any non-humans traveling in the company of the hated race. Mrog and Urr’m, sadly, have never seen a human and aren’t entirely sure what they are supposed to be looking for. Vorom knows the smell of humans, but has found it nearly impossible to communicate with the two stupid giants. He can only hope to lead by example. The bridge across the moat of lava is wide and sturdy, expertly crafted of starrock and mithril by the dark dwarves of Doborgajn. There is, however, more to this bridge than meets the eye. During its construction more than a few of the dark dwarves perished, and their spirits haunt the pathway that leads to Matulek’s castle. These ghosts are malign and must be appeased or else they will utilize their limited powers over the physical world to kill anyone attempting to cross the bridge by summoning up a terrible wind to push the travelers over the edge and into the moat of lava below. The one sure way to appease the prideful dwarf ghosts is to praise their workmanship, as well as that of their ancestors and descendants, sufficiently. These spirits are susceptible to flattery but have a keen ear for insincerity and will react poorly if they sense that the speaker(s) are false in their words. A Lore check vs TN 18 should provide enough information about the dark dwarves of Doborgajn to allow substantial yet sincere flattery. The great gate of Matulek’s castle stands shut at the end of the bridge. Only the mightiest of creatures (or, perhaps, a number of less mighty creatures working in concert) can hope to push the towering brass doors open. To accomplish this herculean task a Lift check against TN 23 must be made. Further, the doors themselves are filled with molten lava, which makes handling them a sure way to suffer terrible burns. Each attempt to open the doors much be accompanied by a Stamina check against TN 13. Failure on this check results in 5D damage. Success yields only 2D damage. No damage is delivered to individuals who are resistant to fire damage (such as, perhaps, a recipient of the Resist Elements spell). In the heart of the castle stands the Fire Giant’s Forge. Matulek works tirelessly, day and night, turning raw ore into pure demonic steel with the aid of the captive demon Kuula Gaahal. Matulek will immediately attack any who dare to enter and will defend his castle and forge to the death. Kuula Gaahal, whose essence is imprisoned within the forge itself, cannot affect the battle (and wouldn’t if it could). If Matulek is defeated Kuula Gaahal will begin reaching out to the heroes telepathically, begging for them to destroy the forge. If they do, Kuula Gaahal will be freed and will instantly return to its home plane. Thus freed, the demon will think kindly on its rescuers and may one day return the favor. If, however, the heroes refuse to destroy the forge and leave Kuula Gaahal trapped, it will hold an eternal grudge against the party and, if it ever manages to escape, will most certainly have its vengeance. Deeper within the castle is Matulek’s treasury. Here the fire giant keeps a large hoard, and a sizable fortune in gold and platinum coins can be hauled away. Here also is the stash of demonic steel that has been forged so far. There is enough demonic steel for two score man-sized weapons. This material, which is essentially priceless – at least to those who are not bothered by its nature – can be liberated with relative ease. Weapons made of demonic steel grant a +1D damage bonus. Further, all damage done by such a weapon is much harder to heal. Spellcasters face a −2D penalty when attempting to cast healing on such a wound and the Might check for natural healing of such a wound incurs a −1D penalty. 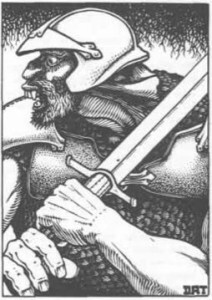 Being in possession of a demonic steel weapon lends a distinctly evil cast to the wielder, imposing a −2D penalty to all “positive” Charm rolls (i.e., Command or Diplomacy, but not Intimidation). Most “civilized” weapon makers will either refuse to work with the material or will charge hefty “My soul is imperiled just handling this stuff” fees if they are willing to work the stuff. Oh, well hello Mr Giant! these get better and better. Thanks, Gobbo! It was a lot of fun to bang these out and good practice making the PDF. Enjoy ’em, amigo! How about converting this for LL, VP? This one in particular, Nathaniel? Or all 5 of ’em? This one should be pretty easy, since it mostly just takes subbing in the appropriate monsters straight from LL. For Room 2 I’d just have “learned” types (MUs, Clerics, Bards if you’re using ’em somehow) make an appropriate roll – either against a specific ability or just a d20 under INT – to know enough to be able to flatter the ghosts. For Room 3 I’d call for a Save vs. Breath Attack to avoid the damage from the intense heat of the door. Success results in only 2d8 damage, while failure yields 4d8 damage. The same type of resistances (e.g., the recipient of a Resist Fire spell or someone wearing a Ring of Fire Resistance) would help as well. For Room 4, Matulek’s Demonic Flamesword is a Sword +1, Flame Tongue (LL, p. 120) with the added effects of a Demonic Steel weapon (see below). People wielding Demonic Steel weapons are treated as having a Charisma value equal to half their actual CHA when determining reaction adjustments and such. I was thinking of using it to boost the PCs in my B/X game a level before they go on to X4: Master of the Desert Nomads. They left the Lost City around mid-level 6 and I’d like to see them at 7. The heat theme goes well with the desert settings they’ve been parading around in so far and the Demonic Metal is a nice little twist to the usual treasure, one that can be used to test their alignments. Sounds like a fun game you’ve got going, Nathaniel. X4 is my wife’s favorite old module from back in the day. And the Lost City, well, what can you say about that one that hasn’t already been said? I hope my notes above make this usable for your purposes. I’ll see about squeezing in the time to make notes on the other 5 Room Dungeons as well.